In 1970, the Institute of Space and Aeronautical Science of the University of Tokyo, the predecessor of ISAS, succeeded in launching Japan's first artificial satellite OHSUMI with the L (Lambda) rocket. Since then, the M rocket series developed for the launch of scientific satellites has undergone successive improvements over 25 years. The first generation M-4S was a four-stage type and kept its attitude by tail fin and spinning. Orbit injection was made by gravity turn. The second generation M-3C was a three-stage type, with enhanced second and third stages. The installation of the TVC (Thrust Vector Control) and side-jet systems on the second stage greatly improved orbit-injection accuracy. The extension of the first stage of the M-3C increased the payload capacity of the M-3H version. In the third-generation M-3S, the introduction of the TVC system to the first stage improved orbit-injection accuracy and eased launching limitations. 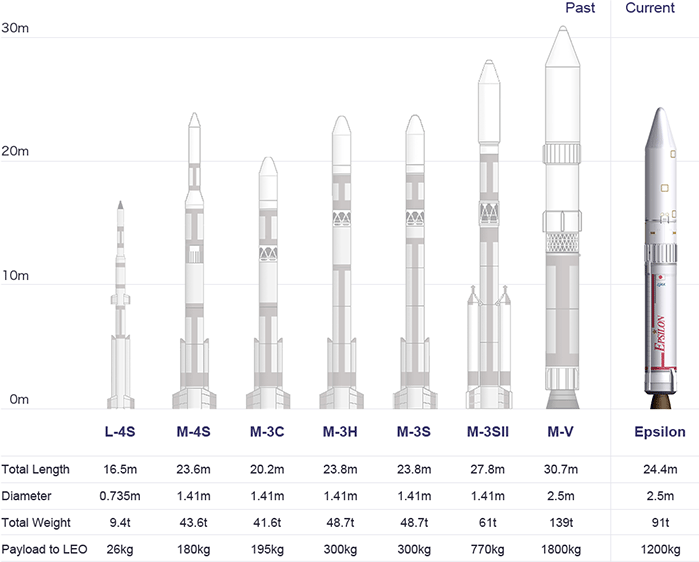 For the fourth generation M-3SII, we redeveloped the entire rocket, except for the first stage, to upgrade overall performance. 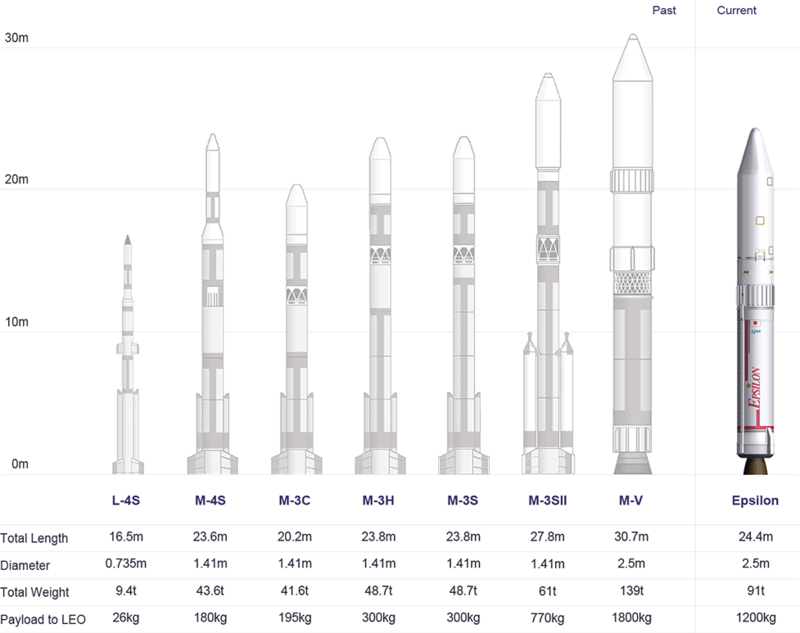 For the fifth generation M-V, we put together all our technologies cultivated throughout the M series rocket's history and succeeded in developing the significant large-scale launcher in order to meet the demands of space science. After the M-V-7 in September 2006, JAXA discontinued the M-V series for various reasons, however, and started developing a new solid-propellant rocket "Epsilon" which is smaller, higher functioning and better suited for launching small satellites.